You probably cannot design your PCB with the "regular" smaller vias (~0.4mm) unless you can find smaller rivets. The smallest I found were tiny 0.6mm (OD) which are already harder to secure I guess (I would try to use a pin?). 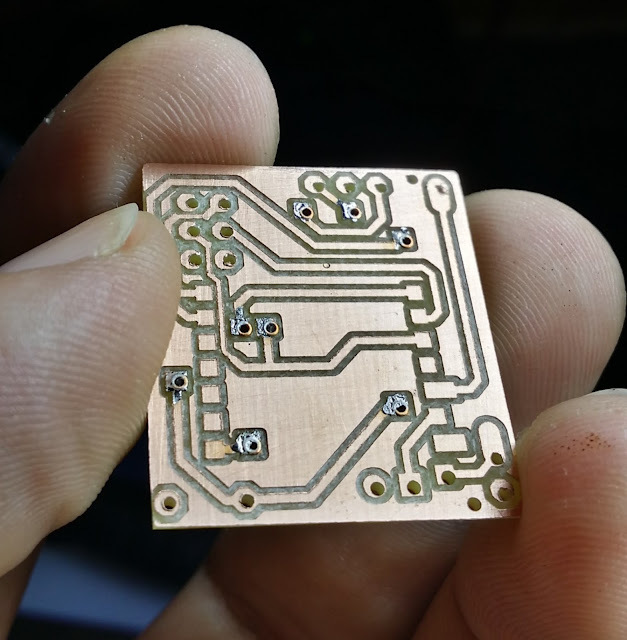 Larger rivets will impact on your design as you may not be able to pack as much vias on a given surface as when using wires, or professional PCB etching. 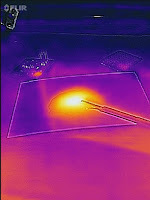 But even when you send them to a board manufacturer later you still benefited from the valuable home-made prototyping. And tweaking a design afterwards is easy. Making it work in the first place is harder! So there are different sizes from 0.6mm to 1.9 outer diameter. I did not find one with an inside diameter of 1.2mm: they would make life much easier for headers and connectors that will not fit in the ones I bought. Sadly indeed, unless you go really big (1.9 outer diameter! ), the rivets may not help you with headers. but there are others, and cheaper on aliexpress. Now, they are expensive for sure, but they really are worth their price IMHO. 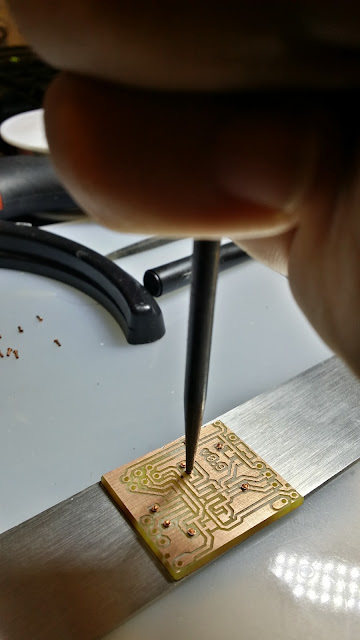 The best thing to do is upfront: route all the traces so that through-hole components can be soldered only/mainly on the under side of the board. This is a general issue, not specifically related to rivets, though they can help a lot here. the case with homemade PCB, you want to avoid having to solder legs on the bottom and on the top layers. The latter is obviously difficult because the component body is in the way. The problem arises also when a through-hole leg is used to route signals from one plane to another. So better design your layout with this in mind, possibly by adding explicit vias to do the job. Now if you cannot do so (or if you forget to do so as I did on the right), proceed with extreme mechanical caution! Double-row headers such as the ICSP header above are hellish in this regard. What I end up doing is to first loosen the plastic bracket a bit by sliding the pins through it beforehand. Then I move it flush to the top of the pins, and I solder the bottom side. 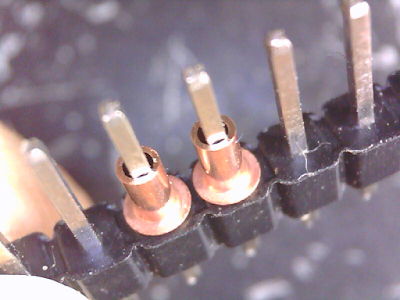 When the pins are locked at two points, shearing is less likely to occur, so I still recommend to solder both sides for a more robust connection when possible. Use a thin soldering tip, making sure not to use too much solder on the top layer. 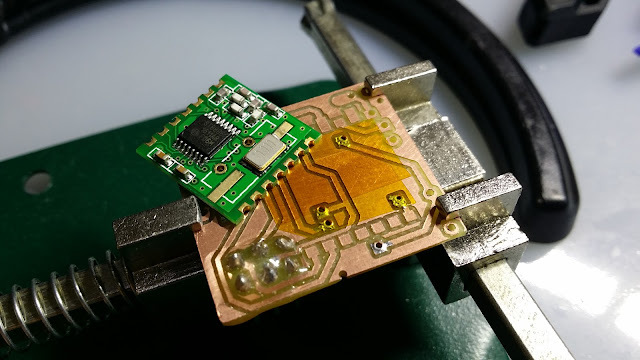 Adding epoxy is probably a good thing also, especially for such a connector that will be used a lot. It will also help dissipate the large stress when the plastic bracket is sled in place. 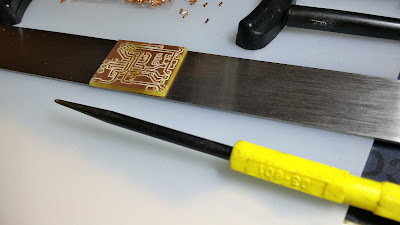 One day I will proceed in two steps for a better looking result: first I solder the bottom side, I may solder the top but with very little solder to stay as flush as possible. Then I bury the bottom solder points in epoxy. Only once it is cured, I then add a little dab of epoxy also on the top between the legs, and then I slide the plastic bracket back to the PCB surface before the epoxy has cured. I suspect I would get better results, and still get a solid connector. but look how close the heads are already ! No way a trace can be router between them. Funny game: populating the board with 0.8mm OD rivets (in 0.8mm drilled holes). The board is halfway on the ruler here, because the rivets are protruding from below. (other) side of the PCB, before the tails are pushed down and enlarged. Do not use a soft surface to push on the rivets from the other side! Here it is. Huuh. Use a conic, pointy tool that has an "appropriate" diameter and shape. This one is not wide enough I think, as can be seen in the first picture of the post. 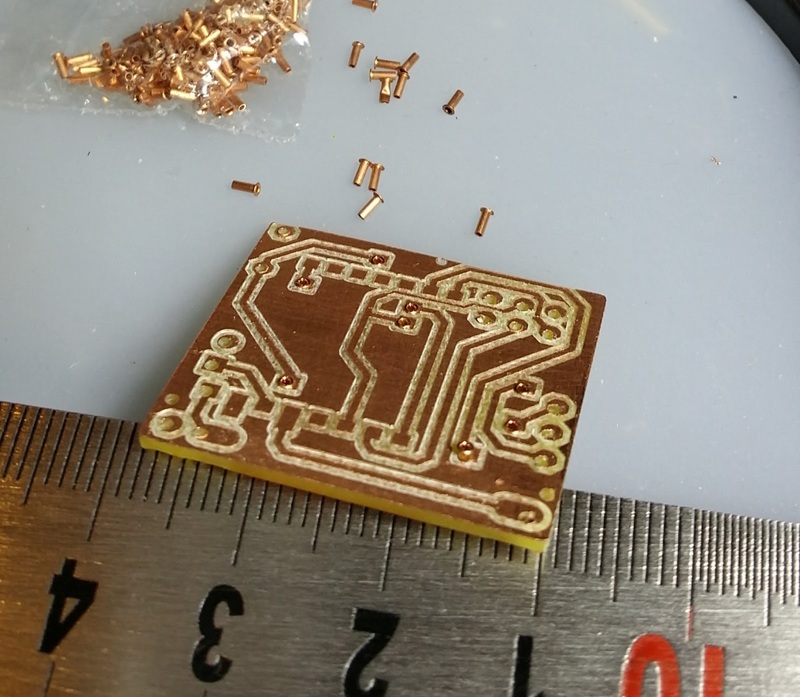 and it also really helps pinching the copper rings/pads to the PCB, which is very desirable! (even though I never had an issue, the copper rivets really are flawless!). because I want the result to be as flush as possible, as required by the radio module I solder on the surface. 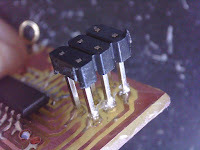 Using rivets proved another advantage: there are no protruding soldering points like when wire is used instead for the vias. I still used a piece of kapton to make sure the serrated radio module would not make contact with a rivet head. 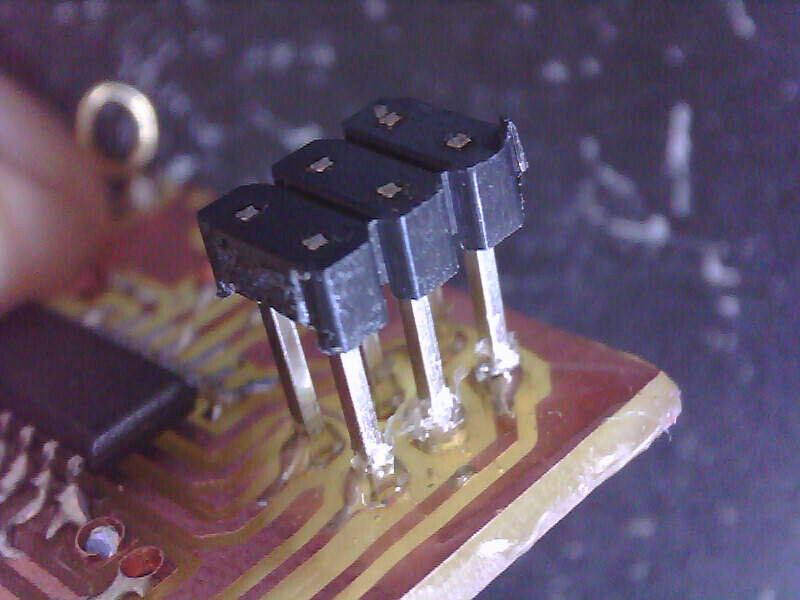 as it will be used a lot, and copper traces do not stick very well on these really crappy PCB clads. Here we are, I hope it will help some of you.